Welcome to my 5-part series: The Five W’s of How I Shop. As a former newspaper reporter, I often focused on the Five W’s of writing – Who, What, Where, When, and Why. Since I often get asked about how I shop, and I’ve decided to share this series with you in the hopes that it will make you think about how you shop. Consider your own five W’s and it will help you become a better frugal shopper. Sometimes it helps to stop and think about who you are shopping for? Are you shopping for your spouse or your kids? Your family or friends? Do you ever shop for yourself? Or do you shop for yourself too much? When I was a kid I would squirrel away a part of my allowance each week for gifts. Back then, I shopped for Christmas gifts for six people. Now that I’m married with children, my list has grown to more than 20 people. And even though the list is long, it doesn’t matter when you’re prepared. I currently do the bulk of the household shopping, with the occasional coupon quest I send my husband on. Most of my shopping is done for my family, which consists of my husband and my three boys – ages four and two, and our dog. Throughout the year I purchase gifts for my immediate family, as well as for extended family and friends. As I’ve gotten older, I’ve worked harder to trim that shopping list – not because I don’t care about them, but because I think there are better ways to show someone you can than with a gift. When I’ve maxed out my stockpile and see a great deal, I’ll still stock up to donate to a local non-profit group such as the Salvation Army or local food bank. I don’t shop to prove anything to anyone. In that sense, I guess you could say I shop for myself. 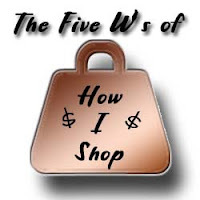 Please share who you shop for and check out my other posts in The Five W’s of How I Shop series.